My friend and colleague in the study of Bolognese swordsmanship, Steven Reich fron NoVA-Assalto, pointed out an interesting chapter in Francesco Altoni’s Monomacchia, where he discusses how the buckler is to be used. The suggestion from Steven to look at this was timely advice, since the plan for our local group is to pick up sword and buckler training later in the autumn. While the combination appears to be the starting point for new students in both Marozzo’s and Manciolino’s curriculum, there is little advice given as to how the small shield should be held and operated. I always feel a bit bad just making stuff up–especially fundamentals like this–so finding Altoni’s advice is extremely comforting. Altoni is an excellent source to work with because in the end of his work he has short notes on each of his chapters. Perfect for quick review and aide-mémoire, it serves as an index to the contents of his book. After checking from the notes it is easy to go back to the longer text for more details: in this case chapter eight of his second book. Altoni instructs the reader to hold the buckler with the thumb along the handle for a stronger grip and the handle straight in the hand. Whenever the buckler is to be moved from side to side, the body should be properly aligned to counterweight, not losing ground unless to extend slightly further to reach and then resetting back. To parry strikes, the buckler is to be used just as a dagger, turning the thumb clockwise against a <span class="glossaryLink cmtt_Strikes" data-tooltip="
Literally "right hand". Refers to strikes that originate from the right (sword-hand) side of the fencer. Mandritto is a roof term for these cuts, but on its own it refers typically to a downwards diagonal cut from the right with the true edge, a mandritto sgualembrato. ">mandritto and counter-clockwise against a roverso. Just as parrying with the sword’s true edge. If the strike is coming from high the thumb will be pointing straight up. When pointing the sword towards the opponent, the buckler hand will be extended higher than the sword hand. It will be ready to turn quickly like a mirror towards where needed to protect the sword hand. Altoni compares the buckler to other sidearms noting how the buckler covers the hand unlike the dagger, and how it is very safe when held together with the sword hand and pointed towards the opponent. On the other hand, latoni considers a targa better than the buckler. This would go well with Marozzo’s curriculum: the small buckler is used in the play of blunt swords, whereas large bucklers or targhe are used with sharp swords. The problem is that Altoni was not Bolognese. Can we follow his advice? We would go with the Bolognese sources had they gone into such amount detail as Altoni does. Unfortunately they don’t, which is why we look at other sources from the same era and region. Altoni was Florentine, some hundred kilometers south from Bologna, and wrote sometime in the first half of the 16th century. I don’t think that is too far off. Is there something different, then? The illustrations in Marozzo do not show the thumb along the handle, so maybe this can be left as a question of personal preference, and the thumb can be used as a pedagogical device in teaching the positions of the buckler. Marozzo shows quite often the hands separated in the illustrations, but the text has plenty of mention about the buckler being joined with the sword hand. Manciolino, in his Primo Assalto, often tells us to protect the head well with the buckler. Perhaps there, we could at least make sure we think of turning the buckler towards the most likely attack as a pre-emptive protection. 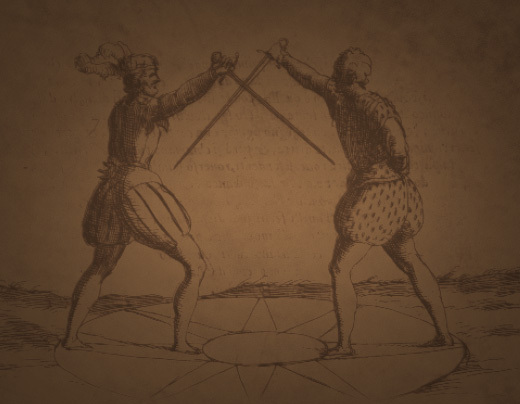 Finally, Altoni’s metaphor of using the buckler as a mirror (against opponent’s sword) is mentioned by both Marozzo and Manciolino as well in their assalti. The Bolognese masters have the student turn the buckler inwards towards the face in the way of a mirror–obviously not as a defensive action–but perhaps to remind of the purpose of the buckler in mirroring the threat of the opponent’s sword.